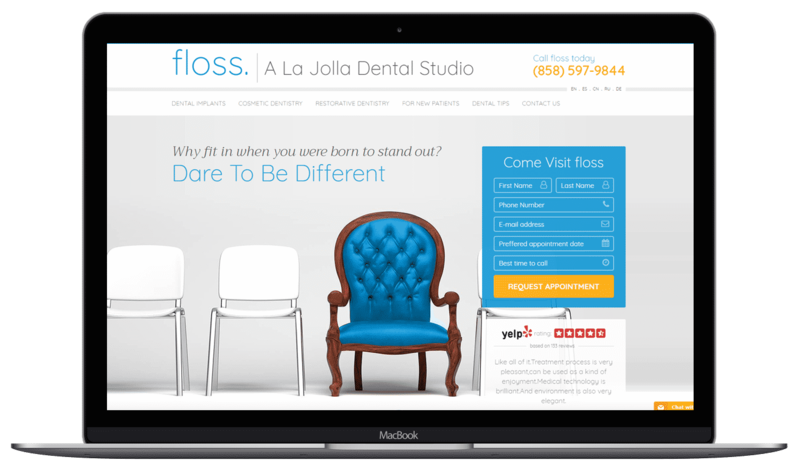 WordPress Website, Floss Dental - NOYO Web Development Inc.
Over the past 3 years, NOYO has built two fantastic websites for us. Not only do the websites look great, but they are functional and catalyze our business growth. Technical support is immediate and the team is highly responsive to our needs. We plan on growing with NOYO well into the future. Which team can you depend on to make it a calm, comfortable experience? At floss, we recognize what is important when choosing the right dentist for you. From the quality of the equipment to the doctor’s credentials – down to the smallest details of the office environment, it all plays a role in finding a dental practice you can trust. Here are what you should look for in a La Jolla dentist in San Diego. They say the eyes are the windows to the soul. If that’s true, then the mouth is the front door. Our mouths are a gateway for illness, affecting the wellness of our entire body. Dental bacteria contributes role in many serious health conditions, including heart disease, diabetes, stroke and even Alzheimer’s. The Surgeon General reports that 80% of American adults have gum disease. That’s four out of every five people! Because of this link between the wellness of the mouth and the wellness of the body, high-quality dental care is crucial. At floss we take a comprehensive approach to dentistry, building a healthy body from the foundation of a healthy mouth – a true focus on total health. Healthy gums lower our risk for many systemic diseases, while gum therapy improves blood vessel health and helps prevent cardiovascular problems. The same plaque that builds up on our teeth can build up in arteries and heart, creating blockages. Proper dental care calls for a visit to the dentist at least twice per year. Complete health dentistry means your dentist can spot warning signs and even diagnose dangerous health conditions while you’re in the chair, sometimes when you’re completely unaware there’s a problem. When choosing a dentist, you want someone you can reach in an emergency. A team that’s available and accommodating when you have follow-up questions, even when it’s after 5 or on a weekend. The staff at floss offers unmatched accessibility. It’s what sets us apart. Our practice was built upon forming solid, lasting relationships with our patients. There’s a reason our clients keep returning to floss – because we’re accessible and we truly care about our patients. Increasingly, dental practices are being bought up by corporate entities and venture capitalists. Why? To make a profit. When you’re focused on the bottom line, it’s impossible to provide the superior level of care we strive for every day at floss. Instead, it becomes all about the numbers. The problem for consumers is that you can’t always readily tell if a practice is corporately owned. Sometimes, the business is bought out but retains the same name it had under private ownership. Ask questions and do a little background research to find out the ownership details of any practice you’re considering using. floss in La Jolla is not and never will be corporately owned. After all, is rock-bottom pricing really a quality you want in your dental work? Do you like seeing the same faces when you visit? Yep, we do too in our own lives. Not only do patients like coming here, but our team LOVES working here. And when you’re passionate and love your job , well, great things happen daily! Take stock of where you live, work and spend the majority of your time. Look for a practice that’s close to where you spend the most time or along one of the major thoroughfares you travel regularly. When you’re rushing from a business meeting to make it to that dentist appointment you almost forgot about, you’ll be glad to have chosen an office that’s right around the corner. floss is located in the heart of San Diego Exit 28 off Interstate 5 and Exit 25 off Interstate 805. Convenience – now that’s something to smile about. What’s the first thing you do when you’re thinking of using a business? You Google them. Your dentist should be no different. Online reviews are honest and straightforward–a great way to get an unfiltered look at what other patients really think of a company. You’ll find floss has the highest rating on Yelpamong San Diego or La Jolla Dentists. We’ll let our satisfied patients do the talking. If you want an excellent smile, you need a dentist with excellent training. As you’re considering a physician, check out his or her credentials and special certifications. If they’re not displayed prominently on the website or in the office, ask about them! A dentist who does silver-mercury fillings all day probably is not the best candidate to be crafting your porcelain veneers, but it happens all the time. Our doctor does not dabble. Dr. Mehdizadeh has specific proficiency in the areas of cosmetic dentistry and smile design, implant surgery, and IV sedation. We’re constantly participating in continued education programs to learn to use the newest technologies and stay abreast of industry best practices. Simply put, we’re committed to being the best in the business. For more information on our training, meet Dr. Mehdizadeh. When it comes to your smile, you shouldn’t take shortcuts. Don’t settle for a practice that uses outdated equipment and decade-old technology. After all, if there’s a serious problem, you don’t want it to slide by undetected for another six months. We believe in investing our money back into the practice to offer our patients the most advanced dental technology on the market. A trip to the dentist can be stressful, even scary. Your dental office should be a calming experience that leaves you relaxed. There’s no sitting shoulder-to-shoulder in rigid classroom chairs like you do in some other offices. From the moment you walk in our door, we want you to feel like you’re in the home of a good friend. Comfy couches, and refreshments await. Polished floors offset by soft colors create a soothing environment. It’s an experience for all five senses; we even work to make sure it doesn’t smell like a dentist’s office. If you’re still feeling tense, one of our friendly staff members is always nearby to answer questions and put your mind at ease. Your time is important, plain and simple. But unfortunately, when it comes to the medical industry, adhering to a schedule seems to go out the window. We as a culture have grown so accustomed to waiting an hour or more in the doctor’s office that we take it for the norm. It shouldn’t be that way. When you have an appointment with your dentist, the team should be ready and waiting for your visit, not the other way around. The waiting room floss is usually empty — and for good reason. The majority of the time, we see a patient within minutes of arrival. If not, we consider ourselves late and do everything we can do to get back on schedule. As they say, time is money. We will not waste yours. When choosing a dentist, you want the peace of mind that comes with knowing the equipment used will be clean and safe. Practices with open sterilization are proud of their high standards for cleanliness. At floss our sterilization is at the enter of our practice. Ever wonder why you see the SAME pictures on a lot of dental websites? Here’s a secret that may leave a bad taste in your mouth: oftentimes, the “before and after” photos on a practice’s website are actually stock images purchased from a photo service. Deceptive, right? And the average customer has no way of knowing otherwise. When inquiring about a dental procedure, make it a point to ask if the photos shown are the actual work of the dentist you’ll be seeing. If you don’t see photos of a procedure you’re looking for, ask. We’ll be glad to show you legitimate examples of our expert work. The bottom line is this: you want to choose a dentistry team that truly cares. A team that’s accessible and responds to your needs. One that checks in on you after a procedure to make sure everything is going as planned. We treat patients exactly as we’d treat our own family members—how we’d hope to be treated if the roles were reversed and we were the ones sitting in the dentist’s chair. It sums up everything about our practice.